Update for 12/13/2013: We wrote the post below back in July of 2010. While trying to update a broken link, I found an event that was held yesterday between the EPA and Stadium Assoc. Great to see that efforts are still being made. Here is a current link to the event held yesterday between the EPA and the Stadium Managers Assoc. If you are a stadium manager, you should check out this link to the EPA's Green Sports for Stadiums, Events, and Leagues. A series of sports stadiums across the country have started composting recently (July 2010) thanks to the EPA’s Green Venues Program. The program helps major league & college sports venues green their stadiums and operations across a host of areas, including: energy efficiency, water efficiency, and waste reduction. The Cleveland Browns piloted a composting program in the venue’s kitchens last fall and will be continuing on in the upcoming regular season. The Cleveland Indians also have a kitchen composting program kicking off this season. 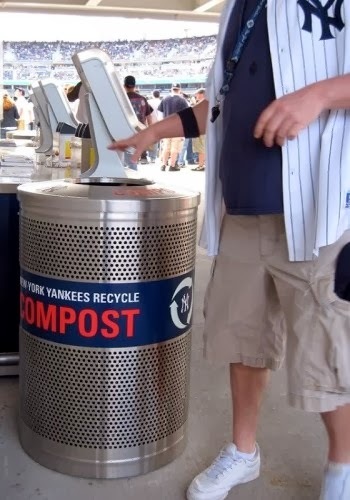 The New York Yankees have a composting program in place and compost bins are available to all fans. The Chicago Cubs are composting and have required all vendors at Wrigley Field to start using compostable food ware. The San Francisco Giants have a composting program in place (and they better since San Francisco requires all residents & businesses to compost!). The Oakland Athletics have a composting program in place. The Seattle Mariners compost >20% of stadium waste. And given the diverse crowds that typically attend ball games, this should translate into increased awareness of composting & composting practices across a very wide swath of citizens. Are there other sports stadiums & arenas in your area that are composting? Let us know and drop them into the comments.